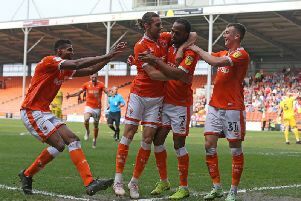 Ishmael Miller believes Blackpool can climb away from danger after his man of the match display in their first win of the season against Cardiff. It’s been a good week for the 27-year-old, who fired his first goal for Pool in Tuesday’s draw at Middlesbrough before turning in an outstanding display in front of the TV cameras on Friday. He was one of the players who suffered most from a lack of pre-season at the club, having only joined the Seasiders in the week running up to the start of the season. And he thinks things are finally coming together at Bloomfield Road. The striker said: “It’s been very difficult and everyone knows the things we’ve been going through here at the start of the season. “It was difficult trying to get going and get everyone sharp. “But I feel like in the last two weeks we’ve been improving and have shown a real togetherness as a club. While Miller didn’t score himself against Cardiff, he created a number of chances, including a superb run and cross for Nathan Delfouneso in the dying moments. Supporters’ protests against the Oyston family during Friday’s game threatened to overshadow Pool’s first victory of the season, but you won’t hear Miller complaining about that. The striker feels the fans have every right to have their say. “Obviously we know the fans just want what’s best for the club,” he added. “We are just here to try to give everything as a team and as a squad for this club. “The fans have the right to do and say what they want to. Friday’s win lifted Pool off the bottom of the Championship table and Bolton remain below them after losing at home to Bournemouth on Saturday. It has given the players a major psychological boost and Miller is totally convinced they can continue to climb out of the relegation zone. “We will be fine, I’m convinced of that,” he said. “Hopefully the last two results can take us forward now and we can kick on.